Peter Haring feels "honoured" that Hearts want him to sign a new contract so soon after he joined the club. The Austrian, 25, is tied to the Tynecastle outfit until the summer of 2020, having joined in June. Haring, who can play in defence and midfield, could make his return from a hernia operation when Craig Levein's side host St Mirren on Saturday. "I know what the gaffer wants and the gaffer knows what I want," said Haring, who has 26 appearances this season. "There is no pressure on time because I still have 18 months left so I'm just taking it easy. "It's an honour for me that the club came to me that early to tell me they want to extend my contract. It's important for the club to have some stability and to try to build that. "That's what the gaffer is trying to do. If you can see a club trying to build something, then that for you as a player is something you of course want to be part of." 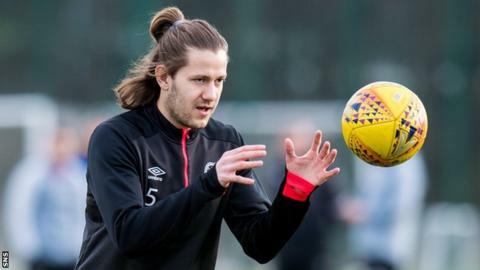 Haring says "Europe is our target" with Hearts fifth in the Scottish Premiership and needing at least a top-four finish to stand a chance of making it into next season's Europa League qualifiers through the league. The Scottish Cup is also an avenue for Levein's side, who lost 2-1 to Motherwell in the league last week after goalkeeper Colin Doyle's late error. "Fir Park is done," said Levein. "There was obviously disappointment for everybody after the game but it's about moving on and staying positive. "Colin's fine. Experienced players tend to get over mistakes quicker than the younger lads. "He's apologised to everybody. Mistakes happen - it's just unfortunate that it came in the last minute and there was not time to do anything about it. The human response is to want to make up for it as quickly as possible and I've sensed that from him."